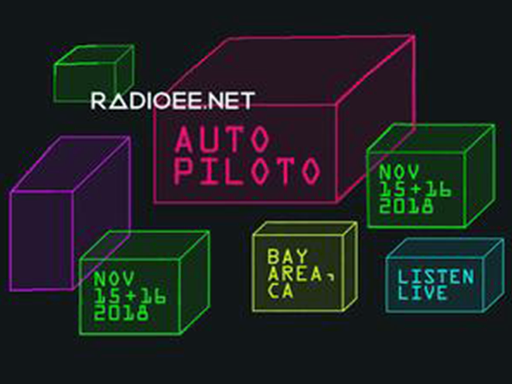 On November 15 and 16 international art collective RADIOEE.net (consisting of Sebastian Bellver, Stephanie Elyse Sherman, and Agustina Woodgate) presented AUTOPILOTO, a marathon 24-hour radio transmission on all things self-driving broadcast live while on-the-move from a semi-autonomous vehicle looping the Bay Area. Transmitted in English, Spanish and Vietnamese, the broadcast explored how autonomy and automatic movement are transforming Bay Area geographies, societies, and cultures, and included interviews with local drivers, designers, technologists, municipal agents, researchers, artists, scientists, mechanics and more, as well as original soundscapes and live performance. AUTOPILOTO was commissioned by the Lucas Artists Program at the Montalvo Arts Center, and presented as part of New Terrains: Mobility and Migration, a series of cross-disciplinary exhibitions, programs and experiences that explore how bodies move through spaces—social, political, literal, and figurative. 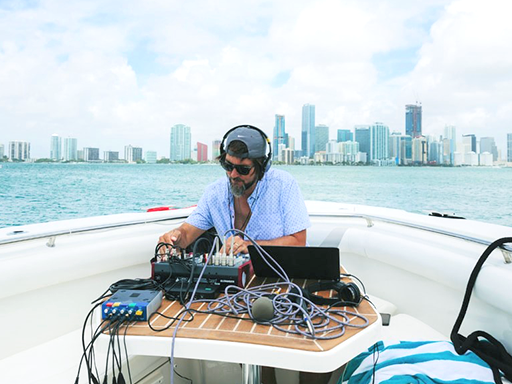 For this broadcast, the RADIOEE.net team were joined by Tina Reden, Fabian Reichle, Sascha Krischock, Keanu Ramos and Diana Larrea as well as drivers Chris Imai, Fernando Palacios, Isaiah Plaza, Craig Warp, and Lori Wood. The broadcast was co-hosted by Trami Cron of Chopsticks Alley Art and included voices from ARUP; fka SV Inc; Nissan Research Center; SETI Institute; Transportation Sustainability Research Center, University of California, Berkeley, Yu-Ai Kai Community Center, and others, as well as live performance and original sound art by artists Anna Fritz, Taylor Ho Bynum, Motoko Honda, Shane A. Myrbeck & Emily Shisko, and San Jose Jazz. All photos are courtesy of RADIOEE.net photographer Diana Larrea. Bryce Hille + Playboyz Inc.
AUTOPILOTO was commissioned by the Lucas Artists Program at Montalvo Arts Center, 2018 and is presented as part of multi-partner initiative, New Terrains: Mobility and Migration, in association with the San Jose Museum of Art. AUTOPILOTO is supported, in part, by the San José Office of Cultural Affairs and the UC San Diego Design Lab. RADIOEE.net artists Agustina Woodgate and Stephanie Sherman, Lucas Artists Program Curator Donna Conwell, and, Special Projects Coordinator at San José Museum of Art Robin Treen sat down for an interview with Sylvanna Falcón, Producer/Host of Voces Críticas on 88.1FM KZSC and 91.9FM KCSB to discuss the upcoming AUTOPILOTO broadcast.